WED, JAN 7th: Join us in Ottawa in front of Indian and Northern Affairs Canada for speeches by Barriere Lake spokespeople, Elizabeth May of the Green Party, NDP parliamentarians, representatives from the Public Service Alliance of Canada and the Canadian Union of Postal Workers, formerly jailed leadership from Ardoch First Nation, and others. Then march to the Hull Detention Centre, where Benjamin Nottaway, the 28-year old Acting Chief of Barriere Lake and father of six, will be spending the holidays. THURS, JAN 8th: Join us in Montreal in front of Jean Charest's office. **Hot chocolate and snacks will be served at both rallies. Benjamin Nottaway, the 28-year old Customary Chief of Barriere Lake and father of six, will be spending the holidays in jail. He is a political prisoner of the governments of Quebec and Canada, who would rather jail an Indigenous leader for peaceful protest than honour landmark agreements and respect a community's customary leadership selection process. * Donations encouraged. Food and drinks available. On December 4th a caravan of community members and a few Montreal supporters will be hitting the road to visit First Nations communities facing similar struggles: sovereignty, Aboriginal rights and title, and defending their lands from excessive resource extraction. Kingston will be the first stop. Come join us! Thanks for coming out! We raised almost $200 for the radio, bringing the grand total to $650. We need $2,350 to get reach our goal. For many years Barriere Lake has experienced the loss of their land, language and culture. In 1961 they were squeezed onto a 59-acre reserve, in the 1970s they were forced to attend Residential School and since 1992 they have been fighting to have agreements with Quebec and Canada that promise the co-management of their traditional territory honoured. Join Barriere Lake Solidarity in helping Barriere Lake TAKE BACK THE AIRWAVES. Barriere Lake Algonquins, with support from the Barriere Lake Solidarity Collective, are in the process of starting up a 15 watt FM radio station: Mitchikinabiko'inik Nodaktcigen (Radio Barriere Lake) on the Rapid Lake Reserve. The community is working to raise $3,000 needed to get this project off the ground. The primary aim of the project is to serve the Barriere Lake community, with the intention of strengthening language, autonomy, culture and traditions. Please bring a donation for the radio station or a RADIO! This CANADIAN PREMIERE SCREENING is co-presented by RIDM, Montreal's International Documentary Film Festival and our friends at Barriere Lake Solidarity who are working with the Algonquins of Barriere Lake, who are starting up their own radio station, similar to the one featured in the film. SYNOPSIS: A lone radio station on a small hill in South Dakota, founded in the 1970s by activists of the North American Indian resistance movement: KILI RADIO – “Voice of the Lakota Nation". A forgotten place between struggle and hope, between Indian legends and everyday life on the poorest reservation in the USA. But there is Roxanne Two Bulls, who wants to begin a new life on the land of her ancestors, and the young DJ, Derrick, who discovers his talent for music at KILI. There is also Bruce, Caucasian, an attorney who has attempted to get an Indian activist released from prison for the past 30 years. And a sudden appearance by the former AIM activist John Trudell, who launched a career as a musician in Hollywood. Everything converges at KILI RADIO, and instead of sending smoke signals KILI transmits its signals throughout the vast and magnificent landscape, with a delightful combination of humour and melancholy. Native hip hop and broken windshields: pride has been restored – it really is OK to be Lakota. For more information on this screening and others and to watch the trailer, please visit Cinema Politica. For childcare or translation call 514-398-7432, 48 hours in advance. How well does Canada live up to its reputation as a human rights champion? When it comes to the situation of Indigenous peoples, it falls dreadfully short. Few people know that the Canadian government is regularly condemned by the United Nations. Canada doesn't only ignore minimum provisions of international law -- it also thinks little of domestic legal standards set by the Supreme Court. In its determination to retain control over the lands and resources of Indigenous peoples, Canada runs rough-shod over the emerging framework of international and domestic law supporting the rights of Indigenous peoples to self-determination and ownership of their traditional territories. Few people can speak better to this reality than Arthur Manuel, spokesperson for the Indigenous Network on Economies and Trade. Former Chief of the Neskonlith Band and chairperson of the Interior Alliance of BC First Nations, Manuel has been a leading voice of opposition to the Canadian government's agenda to "extinguish" Aboriginal and Treaty rights and assimilate Indigenous peoples into the Canadian body politic. Active locally in defense of Shuswap land (during the expansion of the Sun Peaks resort), and at the national level, he has also taken the struggle international, following in the path of his father, the late George Manuel, President of the National Indian Brotherhood and founder of the World Council of Indigenous Peoples. In the lecture, Manuel will lay out an alternative agenda for First Nations to achieve economic empowerment, third order government, and social and environmental justice. Since the Department of Indian Affairs ousted their Customary Chief and Council in March 2008 and used the Surete du Quebec to forcibly impose the authority of a minority community faction, the Barriere Lake Algonquins have been organizing to roll-back the quiet coup d'etat. They are campaigning to make the government honour a number of agreements, including the Trilateral, a internationally praised land co-management and resource-revenue sharing deal the Algonquins signed with Canada and Quebec in 1991. It would significantly protect their forests from clear-cut logging, but it remains unimplemented. They first signed the agreement after a campaign of logging road blockades, which culminated in a one-day blockade of highway 117, a crucial economic vein in Northern Quebec, in 1990. 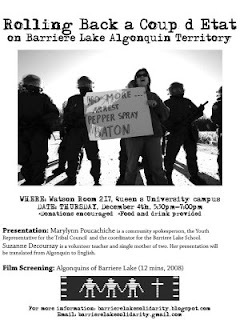 In October, 2008, Barriere Lake returned to the blockades, to force the government to respect their agreements and their leadership customs. The SQ brutally put down the peaceful action. Community representatives will be joined by Arthur Manuel and Russell Diabo, a noted aboriginal policy analyst, editor of the First Nations Strategic Bulletin and advisor to Barriere Lake's Tribal Council, the Algonquin Nation Secretariat. Hear from Barriere Lake Algonquin community representatives, in the midst of an electoral campaign targeting Pontiac Riding Conservative Minister Lawrence Cannon. After racist remarks from Cannon's aide triggered a national media frenzy last week, Cannon was forced to meet with Barriere Lake representatives. The community had been calling for a meeting without luck since Cannon's election in 2006 -- this summer, they picketed his office, camped out and protested for several days in Ottawa, and peacefully sat-in in one of his constituency offices, after which some Algonquin youth and their supporters were arrested. On Friday, they finally met for brief negotiations, but Cannon would not consider agreeing to their demands. Since the Department of Indian Affairs ousted their Customary Chief and Council in March 2008 and used the Surete du Quebec to forcibly impose the authority of a minority community faction, the Algonquins have been organizing to roll-back the quiet coup d'etat. They are campaigning to make the government honour a number of agreements, including the Trilateral, a internationally praised land co-management and resource-revenue sharing deal the Algonquins signed with Canada and Quebec in 1991. It remains unimplemented. ***Donations of money are encouraged to support the community's campaign – they need money for gas to travel. Dried goods are also welcome. Click here for a full list of community needs and to make an online donation. Michel Thusky: Band Manager from 1980 to 1996, he has been heavily involved in the Trilateral agreement land-use consultations and research. He is a residential school survivor, and a community spokesperson. Norman Matchewan: A teacher in Barriere Lake's Algonquin elementary school, he is Barriere Lake's youth spokesperson. Less than two centuries ago, the Algonquin nation occupied land stretching from Laval to Lake Huron. Despite never ceding their land rights, the Algonquin today are squeezed onto small reserves, while corporations freely plunder their natural resources. Award-wining Québécois filmmaker and folksinger Richard Desjardins and Monderie expose the plight of an oft-ignored people living in our midst. *Be sure to bring a blanket and a sweater in case things cool off. Once so vast, the land of the Algonquin within Quebec has shrunk dramatically. This hard-hitting documentary provides a sympathetic glimpse of a nation of 9,000 people who suffer while the rest of us look the other way. Afterward, hear about the resistance mounted by one Algonquin community, Barriere Lake, in their effort to regain control over their traditional territories and protect the forest from clear-cut logging. Find out more about the role of non-native solidarity. Part of QPIRG McGill's Radical Summer Film Series. Peaceful demonstration in support of Barriere Lake community members who are in Ottawa to demand a meeting with their riding MP Lawrence Cannon, a leadership re-selection in accordance with their Customary Governance Code, which has been blatantly violated by the Federal Government, and that the Federal Government respect all signed agreements with the community. Marylynn Poucachiche: Barriere Lake's Youth Representative to the Algonquin Nation Secretariat and she is involved in community education. She acts as a community spokesperson. Michel Thusky: Band Manager from 1980 to 1996, he assists community members in their dealings with government agencies. He has been heavily involved with the Trilateral Agreement, is a residential school survivor, and a community spokesperson. Boyce Richardson: Author of four books – including People of Terra Nullius: Betrayal and Rebirth in Aboriginal Canada and Strangers Devour the Land – and director of half a dozen films on indigenous affairs. He was made a member of the Order of Canada in 2002. As you might know, in March the Algonquin community of Barriere Lake, located 400 kms north of Montreal, had their Customary Chief and Council deposed by the Canadian government, with support from the Quebec government, in an attempt to get out of binding agreements signed with the community. It's only the latest chapter in Barriere Lake's very long struggle to wrest control over their lives and lands from governments and corporations. In 1991, Barriere Lake compelled Canada and Quebec to sign a landmark land management and sustainable development agreement, after a campaign of civil disobedience that caught international attention. The agreement set important precedents: it would give Barriere Lake decisive say in the management of 10,000 square kilometers of their traditional territory, protect Algonquin land uses, and give them a share in the resource-revenue from logging and hydro projects on their land. But the federal and provincial governments never liked the agreement, and have tried everything to undermine it – including the unilateral leadership change in March. It's the third time in the past 12 years that the government has refused to recognize the legitimate community leadership. Today, the agreement remains unimplemented. Though a small community with few resources, Barriere Lake has demonstrated remarkable tenacity in their struggle for self-determination and the protection of their culture and land. But it is a struggle that can only succeed with broad support and solidarity from non-native people. The newly-formed Barriere Lake Solidarity collective, taking direction from Barriere Lake, is looking for groups and organizations to ENDORSE THE COMMUNITY'S LIST OF DEMANDS. 7. That the Government of Quebec, in consultation with First Nations, conduct a review of the recommendations of the Ontario Ipperwash Commission for guidance towards improving Quebec-First Nation relations and the SQ's procedures during policing of First Nation communities. **Consider getting INVOLVED in our campaign – as a group, or as an individual – during the upcoming months. **Consider making a DONATION, to support Barriere Lake's needs and to help with our mobilization efforts. Contact us by e-mail to make a donation, or donate directly to Barriere Lake through our website. In this small, impoverished northern village, people eke out a miserable existence. One of the world's most powerful countries occupies their land, plunders their resources, interferes with their governance and seems intent on assimilating them into wider society. With its Olympic Games at hand, the country would rather the international community dwell on its national achievements than cast scrutiny on these abuses. The country? Canada, of course. No doubt Canadians would be shocked by the comparison to China: a liberal democracy, Canada doesn't militarily occupy Native people's land and hasn't imprisoned or executed thousands of Native prisoners. So when Assembly of First Nations Chief Phil Fontaine suggested the comparison was "compelling," and Canada's own 2010 Olympics might warrant protest, editorials stormily reproached Fontaine. He was being "irresponsible," according to the Ottawa Citizen. But Barriere Lake, an Algonquin First Nation 350 km north of Ottawa, might think otherwise. From their viewpoint within Quebec's boreal forest, China and Canada's long-term objectives appear strikingly similar: to absorb a culturally "backward" people, and gain exclusive control of their lands and resources. Neither government has thought twice about dispossessing or displacing them to secure their first priority: unimpeded resource-extraction and industrial development. Human rights seem negligible when the spoils – oil, natural gas, and mineral deposits in Tibet, and a lucrative forestry industry and hydroelectric power on Algonquin land – are so precious. Nor has the Canadian government been shy to crack down on protests. As Chinese police tear-gassed and arrested dozens of Tibetan demonstrators on March 10, the Canadian government was ousting Barriere Lake's leadership, a thorn in its side for years. When community members blockaded the return of an unpopular faction recognized by the government as the new leadership, a provincial riot squad pepper-sprayed and arrested ten. Conspicuously silent about Barriere Lake, Canadian media instead sounded off about Chinese inequities. "China had hoped to long ago seal off Tibet from the world, to make of an ancient land a tomb in which Tibetan religion, language and culture would die," thundered the National Post on March 22. "Yet there is life within that tomb." Swap the countries, and would the storyline have still roused the Post’s indignation? Yet for centuries the Algonquin were officially non-existent, after Euro-Americans deemed North America a terra nullius: a land without people. Their lands were blithely seized and their sacred sites flooded. Their subsistence economies were destroyed as they were squeezed into puny reserves. Their children were stolen and reared in residential schools, in the hope that such brutalization would "civilize" them. Little wonder that Barriere Lake has succumbed to social ills common on many reservations – rampant unemployment, physical and sexual abuse, and alcoholism. But it's still a greater wonder that they've tenaciously maintained their language, culture, and customary governance – that "there is life within that tomb." For all their misdeeds past and present, China and Canada never tire of reminding Tibetans or Native people just how much government revenue they receive. It's as if someone occupied your house, sold off your furniture and belongings and then proclaimed their generosity after throwing you a meagre allowance. The frenzied pre-Olympics expansion in Vancouver is itself a microcosm of continuing injustices. Many of the mountains being carved up for ski hills and resorts, and crisscrossed by new highways, are on traditional territories used by B.C. First Nations – territories which have never been ceded by treaties and the titles to which were affirmed in the seminal 1997 Delgamuukw Supreme Court decision. Canada deals with this awkward fact through the Comprehensive Claims Policy, which is fair-minded only in name. Even before discussing Natives' grievances, the government forces them to surrender collective rights to their territories. Assimilation by any other name would smell as rotten. While negotiations drag on for decades, destructive resource extraction continues unabated. Native communities end up with small parcels of money and land whose underlying title remains with the Crown, a practice the UN's Human Rights Committee has repeatedly condemned for "extinguishing" indigenous rights. Barriere Lake has joined many B.C. indigenous nations in rejecting Comprehensive Claims, proposing alternative frameworks for redress. In 1991, they signed a landmark co-management agreement with Ottawa and Quebec to gain joint management of their territories and a share in resource revenue, while reconciling their land use with the logging industry's interests. Despite this accommodation, neither Ottawa nor Quebec has wanted to relinquish exclusive control of the land. They have undermined the agreement at every turn – the latest effort being last month's regime change. As denunciations of China reach an ear-splitting din, Canadians concerned for human rights might note a final, crucial difference between the governments. Even the perfect storm of international protest has not made an authoritarian regime budge. But a democracy guarding a sensitive reputation might be more easily swayed. When the spotlight shifts from Beijing 2008 to Vancouver 2010, let the protests begin.